An Anne Arundel County man was rescued Thursday morning from the ice-clogged Patapsco River as he clung to the his overturned kayak. Randall Heath, 46, of Pasadena fell from his boat while duck hunting about a quarter-mile offshore. His life jacket did not inflate and could not get back inside. 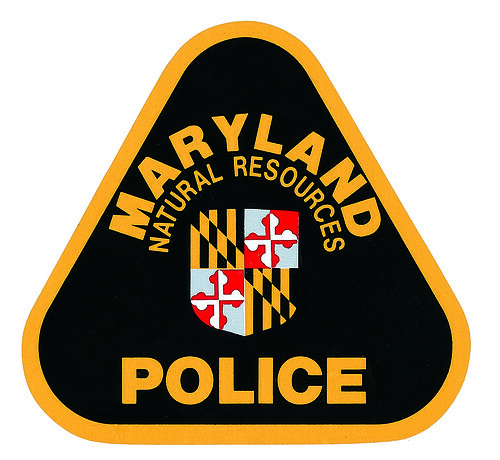 A Maryland Natural Resources Police officer patrolling nearby heard emergency radio calls from Anne Arundel Fire Department and launched a patrol boat from Stoney Creek. 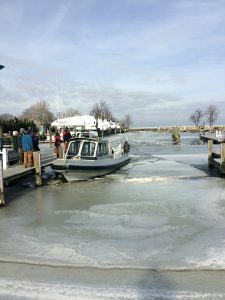 Battling through ice floes up to six inches think, the officer reached the scene in 15 minutes. “I didn’t see anything — it was a field of ice,” Officer Antonio Colvin said. For 10 minutes, he methodically searched the area until a firefighter on shore guided him by phone to the victim. Colvin came alongside the nearly submerged kayak, where Heath was trying desperately to stay afloat. The officer maneuvered the victim to the stern of the patrol boat and tied a rope to his belt loops to keep him from sinking. From there, he wrestled Heath aboard. Meanwhile, Anne Arundel County firefighters in survival suits launched a dinghy and began rowing to the scene. Colvin picked them up and they began reviving Heath, who was shivering uncontrollably and unable to speak. 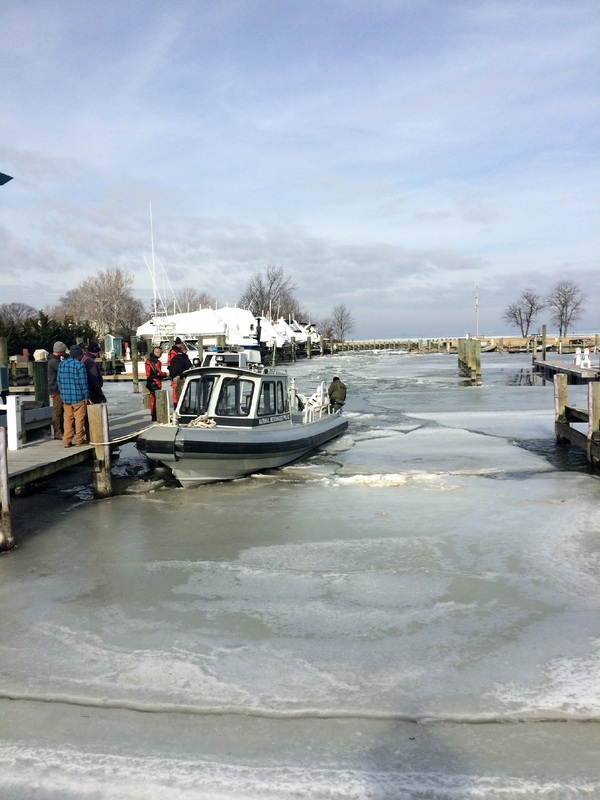 The patrol boat fought its way through the ice to the Atlantic Marina Resorts docks on Knollview Avenue in Pasadena, where emergency medical technicians were waiting. Heath was taken to University of Maryland Baltimore-Washington Medical Center for evaluation and further treatment of hypothermia and a broken hand. Acting on citizen complaints, officers charged a Dorchester County Thursday with hunting violations in an Anne Arundel County neighborhood. Thomas John Piezchalski Sr., 61, of Rhodesdale, received citations for hunting without a license, failing to obtain a federal waterfowl stamp and hunting without a Maryland Migratory Game Bird Stamp. Officers set up early-morning surveillance in the area of Stoney and Cox creeks and found three hunters in the area of Black Rocks at about 7:30 a.m. Two of the hunters were in compliance with state laws. Piezchalski, who was armed with a loaded shotgun, was found in violation. A hearing in Anne Arundel District Court has not been set. If found guilty, Piezchalski could be fined a maximum of $4,500. A Washington, D.C., man was charged last week with illegal hunting during a routine license check by an officer in southern Anne Arundel County. Acting on a tip, an officer issued citations to Thomas James Kavanagh, 46, who shot a deer with a muzzleloader last December. He was charged with hunting without buying a muzzleloader stamp and hunting without buying a bow stamp. A hearing in Anne Arundel District Court has not been set. If found guilty, Kavanagh could be fined a maximum of $3,000.